How Do You Spell LOIN? 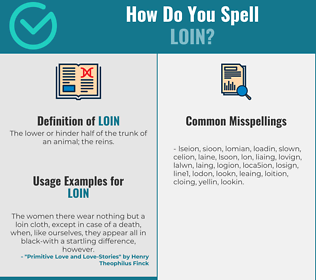 Correct spelling for the English word "loin" is [l_ˈɔɪ_n], [lˈɔ͡ɪn], [lˈɔ‍ɪn]] (IPA phonetic alphabet). Below is the list of 319 misspellings for the word "loin". The lower or hinder half of the trunk of an animal; the reins.